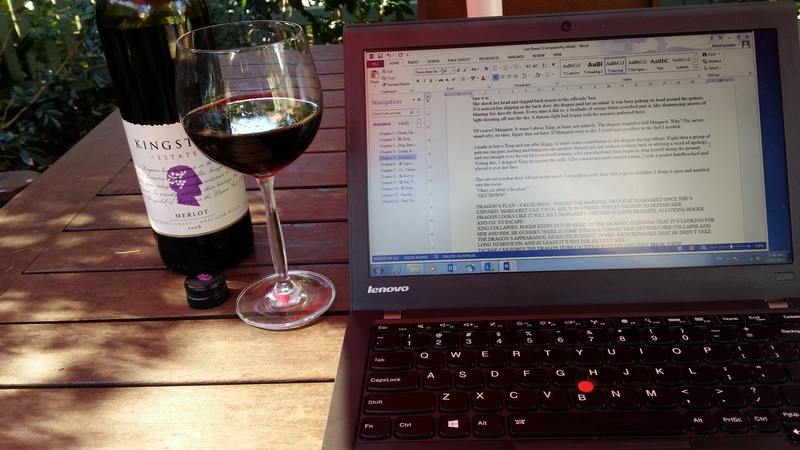 Writing outdoors with a nice 2008 bottle of Merlot with little crystals at the bottom because it’s so awesome. Today, whilst sitting in the best writing spot I know, drinking some excellent old red (why is it all gone?) I had a think about my baddie-guys. This came about as a result of some google researching: what made the Star Wars prequels into such god-awful piles of junk (I wanted to like them. I really tried). Apparently one of the (many) failings was a lack of clear direction for the bad guys. I get this argument. Palpatine might be a very evil dude, but everything he does is political and behind the scenes. If he’d just once strangled a youngling when there were no jedi watching, our investment in his character (and in screaming for his eventual demise) would have shot through the roof. The political intrigue angle is fine, but even then his motives were a little abstract (I followed them, but it wasn’t as much fun as a tense struggle where the heroes actually know what they’re fighting to stop). Better to have a simple bad guy goal, and then complications all around it (e.g. – we build a deathstar!). It’s also hard to get behind the heroes when every other villain is a bumbling doofus. Case in point – General Grievous. He had a phlegmy cough, acted seemingly at random, and his organs were exposed ready to be shot by the first person to notice. The films should have screamed “here’s a big bad, and they’re really bad, look – they kicked a puppy, and you need to hate them, and cheer for the goodie. Maul did it in Phantom Menace, and they killed him off way too quickly. So! My baddies. Working on it. I’ve got “Nemesis” bad-guy, who will hound our hero and keep him running throughout. There’s also “Come Back to the Dark-Side” bad-girl, who wants to lure our hero back to a life of villainy. Finally there are the two sides of the coin, one baddie who represents the “Forces of Order”, and the other representing the “Forces of Chaos”. Our hero has to avoid being sandwiched between or forced to choose a side, and learn to walk his own path. One of these bad-guys is the BIG BAD, who will be willing to wrap a thousand puppies in cling film and launch them into the sun if it gets her any closer to her goals. That’ll hopefully make readers scream for a hero/heroine to appear. Not that there are going to be puppies, or any form of animal cruelty in my book, mind you. Okay there might be puppies. Safe puppies. So yeah. There are lots of kinds of bad-guys. What are some of your favourite bad-guys, and what makes a good bad guy? I’ll start – Tim Curry in ANYTHING. Because he’s Tim Curry. Aside | This entry was posted in Books, Writing and tagged Bad Guys, Baddies, books, characterisation, characters, fiction, science fiction, Star Wars, Writing. Bookmark the permalink. “It’s also hard to get behind the heroes when every other villain is a bumbling doofus.” So true. Villains that make an impact usually have one clearcut and simple goal. If we look back in history, at all the nefarious dictators and underground leaders, their motives could be easily summarized in one line. I enjoy the anti-heroes and anti-villains. They are fun characters to read about. Definitely. My lead is a bit of an antihero, which is perfect because the story is less about choosing sides (everyone is wrong) and more about doing what’s right. Thank you for the surprise re-blog! 🙂 Much appreciated. Oooh, you have to love to hate Tim Curry! What a great bad guy! The really awesome bad guys are human just like us, you know- the day to day grind- hating “the Man”. The more normal they are, the more you hate them when they break and create chaos. – You know, because we are never supposed to break, the machine is never supposed to stop cranking. Those that break free- either, fight for goodness and become super heroes, or break- and want to bring their pain back upon the world! Hannibal Lector, now this is a deep-seated bad guy, once you read the entire series. The world broke him, and once he broke free of the machine- wow. The more you sense their normalcy, the more they really creep you out when they go bad! But, they still make you grieve for their lost humanity. I strongly believe in the mid-story reveal as well. A big-bad should announce their evil intent in a horrific manner about half way through the body of the novel, with foreshadowing in the chapters leading up to it. I love your Hopkins reference with his waltz, so much class. Did you read the book about Hannibal’s childhood? Creepy horror taken all the way to the top level. Very well written. I agree that the potential for redemption is important with a large majority of bad-guys, but I think there’s something to be said for the irredeemable. These characters can inspire horror even if they don’t evoke pity, and I think they sit at the far end of the evil-spectrum. Having said that, the potential-for-redemption thing was done incredibly well in the most recent Dresden Files book, Skin Game. Not going to put any spoilers here, but what went down solidified that character as an awesome bad-guy, and I mean awesome in the old-english sense of “inspiring an overwhelming feeling of fear / reverence”. Haven’t seen The Relic, nor the book with Hannibal’s childhood. What’s the book called? The book is Hannibal Rising. He is portrayed as an anti-hero, and the reason for his becoming a serial killer is shown in this book. You are torn between horrified disgust, and deep sorrow for a human that is so wronged in life. As a writer, I highly recommend this book if you want to write about bad guys. The old-english sense of awesome really bad guy you mentioned- yep, it is in this book. Hannibal is one really bad dude (even as a young man), with no hope, or need for redemption, and that is truly scary. The Relic is a pulp book from the 80’s that came out in the late 90’s maybe as a movie, and it was absolutely horrible. I will definitely look up Skin Game, I haven’t read that yet. Thanks, I think this is the one I haven’t read purely because I didn’t like the title, and made unkind assumptions about the franchise. I will check it out (I know I liked the other two, so it’s a safe read). But, Hannibal is also a beautiful, sensual, compassionate man with a deep love for life that is shown in this book. It really adds depth to his character.